I have a good friend who eats meat only grudgingly. I have never gotten a full explanation from her as to why she doesn’t like it – but some people are satisfied with the answer “I just don’t like it.” Which is ok. She begrudgingly cedes that there is no better source for Vitamin B complex, and Iron, and continues to keep the minimum weekly recommended dosage for red meat by the FDA (I think it’s 4-6 oz per week) in her diet. But most of the time, she sits right at the minimum. It’s an interesting thing to experience for me. We will go out to lunch, and she will almost always order a chicken or fish dish. She appreciates that I love my meat, but it’s just not the same for her. And I can see it – she truly doesn’t enjoy meat the same way that I do. It’s proof, I suppose, that everyone is different. I, however, love meat. And so today’s feature is the Meat Lover’s Salad. You thought the Pizza industry had a strangle-hold on meat lovers? Well, think again! As a note: you may want a left-overs container handy – you’ll have leftover beef and pork after cooking. 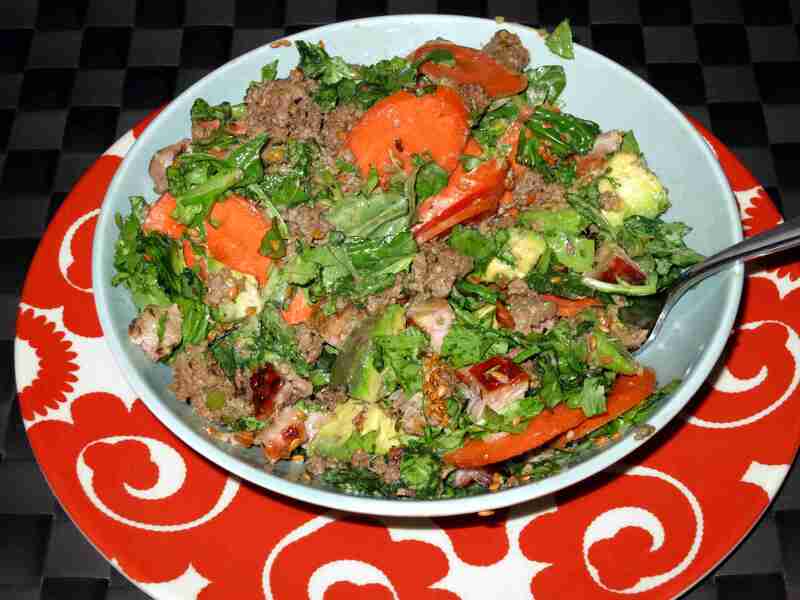 You should only use about 1/2 lb total meat per salad dish. I wrote the recipe for 1 lb of each because that’s how I cooked them – but I put the rest in a leftovers container and saved it for another meal! In separate pans, start to heat up the ground beef and pork. Ideally you’ll have some smoked pork from your last smoking session over the weekend sitting around waiting for you to do something with it (like that ever happens with good smoked meat!). So plunder your stash of great recently smoked meat, and pull out some freshly smoked pork chops! Back to the cooking… If you’re using 90% lean, or 93% lean (that’s the highest I’ve seen) ground beef, you’ll have to add some coconut oil to help with the cooking. Otherwise, the ground beef should have enough internal “juices” to cook itself. Cook this, and the pork if you’re not just re-heating it, on medium-low, covered. You’ll want to stir occasionally to keep it mostly broken up, although some clumping is actually idea. Since you’re only going to use about half of the beef and pork, make sure that you have a leftover container handy for when the meat is done cooking. I usually serve the leftovers container first, throwing the meat directly in to the refrigerator to cool off as quickly as possible. I find that the meat retains it’s flavor longer if it cools off more quickly – perhaps it’s more sanitary too. Either way, you should be serving about 1/2 lb of meat in each salad dish, or less depending on your personal preferences; but not a full pound. I just wrote the recipe for 1 lb of each because that’s how much I had of each meat as I was cooking it up. While the beef and pork are cooking, chop up all the salad ingredients. This is the simple part. Put the mixed greens in a bowl, chop the cilantro and basil up just a bit and add those. Chop up the apple, avocado and crimini mushrooms and add them all to the bowl. Then chop and add the carrots and leeks. When chopping the leeks, I like to cut them down the middle, then lay them flat and slice them – this way, like an onion, they fall apart in your food. Across the top, sprinkle the flaxseed. Finally, chop the prunes up and add them to the top. Prunes are the perfect fruit for this dish. The flavor of prunes meshes beautifully with the apple, and they are both sweet and rich, so they will add their sweetness to the dish while still being complimentary to the meat that will be the feature. As the beef and pork are nearing completion (about 15-20 minutes of slow cooking), add the Aioli to the salad and mix. It’s a great meal to serve warm, like the Hot & Cold Salads, although in this dish, only the meat was cooked. 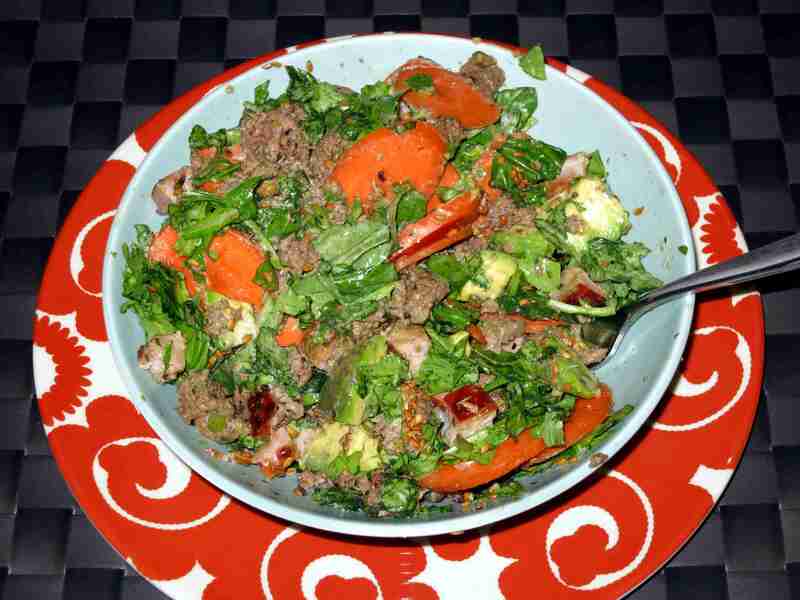 As soon as the meat is done, add it directly to the salad and mix thoroughly. You’re only going to use about 1/2 pound of each of the beef and pork, the rest will go in your leftovers container. You want to mix quickly, because the meat is hot, so mixing will dissipate the heat without discoloring any of the salad greens. For more “What’s For Dinner?” and more recently “What’s For Breakfast?” posts, keep tuned for UPC original recipes, and fully planned meals! If you have any questions or requests, comments or suggestions, please post them up in the comments board!